The news comes days after the announcement that Apple and MLB have signed a deal for coaches to use 12.9 inch iPad Pros in the dugout during real games. The deal gives coaches and managers in the MLB iPad Pros to use, equipped with a custom app for statistics, but usage of the devices is not mandatory. The season has only just begun, so the impact of the Apple-MLB deal is yet to really be seen come to fruition. 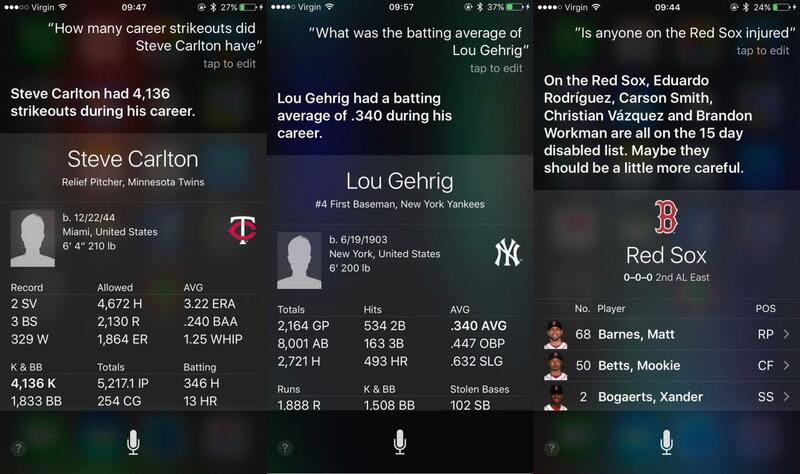 It’s also worth noting that Siri’s coverage of baseball questions is not perfect. Many queries still resulted in WolframAlpha results or fallback Google searches. The voice dictation also struggled to understand the names of many players. By the way, T-Mobile is offering a free year of MLB Premium for customers.